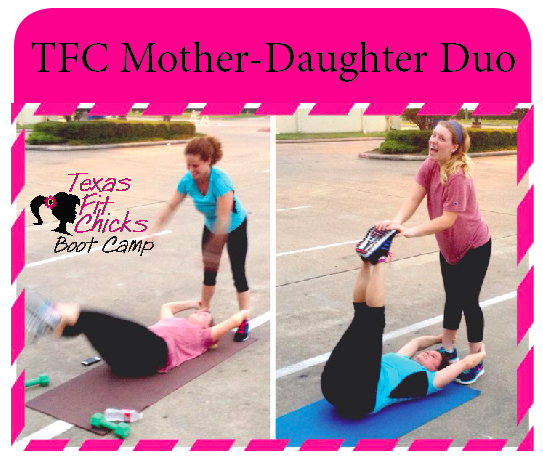 TEXAS FIT CHICK FAMILY DEAL! -When mom enrolls - daughter can join for just $75! keep her FIT over the summer months! No commitment required just $75 for the 4 week session! ~Minimum age to participate is 13. Mom must provide copy of Doctor Athletic Release used in the school districts for jr. high sports before daughters first workout and to receive discount if under age 18 and sign TFC liability release for minor. No other discounts or promotions apply or may be combined with this offer. No makeups for missed classes, offer good for 4 week no excuses boot camp. Ready to sign up? Visit our website, click on 'Sign Up' and Enroll my Daughter in Camp. You will be prompted to enter your TFC ID and password (must enroll as a client or already be enrolled for this promotion) and then you will be able to register your daughter!